I'm So Over Nursing. I would rather work at Costco!! The joy of making a difference in my patients' and family members lives is being overshadowed and diminished by the organization's politics and their #1 priority: keeping the physicians happy and making money. Our purpose as nurses is to provide excellent care and customer service. Our patients are our #1 priority not only just 12+ hours a day or an 80+ hour paycheck, they are always our main concern. Nursing is not patient care anymore, we are becoming the host(esses) of the medical field. I am ready to leave the nursing profession after 6 years. I have a bachelor's degree in biology and got my associate's in nursing. In high school, I decided that I wanted a career in nursing. By the time I entered college, I decided I wanted to become an OB/GYN. Halfway through college, I realized I didn't want to be a doctor. I wasn't sure what I wanted to do but I wasn't going to change my major and start over. Fast forward about 8 years, I considered nursing and applied to nursing school and here I am.....back at square one. I wish I had sacrificed and endured one or two more years of college by changing my major and pursued something else. I often-times cringe when I think of going to work. My attitude changes, my heart races, and anxiety sets in. My coworkers are nothing less than awesome. Most of my patients rock. Both have been unexpected blessings to me and I thank God for our paths crossing. But management, the physicians, and the facility at which I work have made nursing a profession that I wished I had not entered. I never have to wonder how devalued I am when I'm at work. Our voices are not heard, and as a matter of fact, our concerns are considered complaints. Not only am I a caregiver, but I am the business office, auditor, waitress, maid, logistics, IT, quality assurance, babysitter, personal assistant, and the list goes on. When doctors fall short, it is our job to clean the mess up.....and, no, I'm not speaking of mistakes that affect patient care. I speaking of simple documentation that they are supposed to take care of. I understand the importance of having all "I"s dotted and every "T" crossed, but when will the physicians be held accountable? I can't be chasing down physicians when they forget to check the correct box especially when it has little or nothing to do with a patient's outcome. That's not my job. We nurses are stressed, afraid, furious, and just plain depressed as a result of these added responsibilities. We already worry about our patients even after quitting time. After leaving work, many of us call back up to the floor or unit checking on our patients. We are genuinely concerned about them, but it is very obvious that management's agenda is not the patients. Whatever management's agenda is becoming our agenda, right? WRONG!!! I'm here to take care of patients, not physicians. There are so many nurses, YOUNG, fairly new nurses, that I know that started their nursing careers with a clean bill of health. They are now on antidepressants, benzos, blood pressure meds, and others due to the stress and unhappiness. 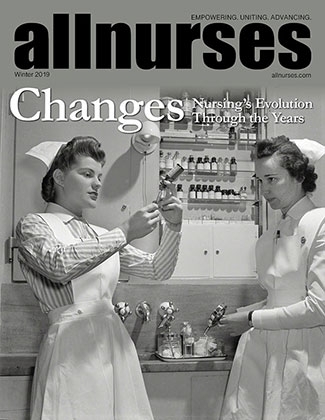 Nursing has gotten away from patient care. It's about making money for the organization which is about making the physicians happy. If that means being stripped of our dignity, we are to do what it takes. I feel as though it is second nature to provide excellent care to our patients. WE have saved many lives anywhere from observing changes in our patients to discovering mistakes made by others (physicians) and correcting them or directing attention to the oversight. I wish they would let us do OUR jobs and provide care and management can run up behind THEIR "customers". If we can keep those two jobs separate, that would be great. We are a vital part in patient care, but yet, we are so underappreciated and taken for granted. We make a positive impact in many lives, but we are the first ones cursed out because someone is having a bad day. Not only are we unappreciated, but we are very disrespected, and in many occasions, we are unfairly belittled and we are just supposed to accept those words because "it's part of the job." I'm done accepting it. I'm reminded every day there are replacements waiting in line. I'm reminded that any fool can do my job. I don't want a pat on my back every time I do a great job, just acknowledge that I am a vital part of the team. I understand human resources has a stack of nursing applicants on their desks. I just don't have to be reminded of that everytime all my paperwork isn't on the chart (because I'm still working on it), or if I come back from lunch two minutes late. I am not cut out to take jabs and low-blows without throwing them back. I have so many responsibilities that I take on from the time I punch the clock to the time I punch out and I refuse to be disrespected by someone with a title because I happen to not move fast enough or I am having to clarify an unclear and, most of the time, an unfinished or incorrect order. I'm helping YOU out!! We genuinely worry and care about our patients that it often consumes us. When a patient codes or expires, we are crushed. I once had a patient who got stuck at least 15 times by various staff members, including physicians, to get IV access. The patient took those sticks like a champ, but I still went home and boo-hooed because I hated to see him go through that. We hurt when our patients hurt. On top of carrying out our responsibility as nurses, we are holding in so much emotion associated with our patients.....yet we get very little to no respect. Don't get me wrong, there are some physicians that I'm in contact with whom are polite and value my opinion and I do appreciate them. Of course, I'm not always right or may not make the most intelligent statements, but they acknowledged my voice. Again, I don't want a cookie. I just want to be acknowledged as a professional. I understand customer service includes dealing with angry, rude, and the dissatisfied. But when I have poured my heart, soul, and emotion into my job and my customers and I am still allowed to be mistreated and insulted, then that becomes a problem. I feel I have no rights as a nurse. Who is protecting me? Who is my voice? Who is standing in my defense? So at this point, it's time for me to bow out from the nursing profession gracefully and while in good standing with the organization, my family, and myself before I am forced out or OD on my meds(or somebody else's). My family, happiness, health, dignity, and peace of mind is worth leaving. They tell me Costco employees never leave. Nurse, mother, daughter, sister, and dog-lover. I'm anti-social, but social. Not a people person, but I am anyway. I'm quiet, but loud. We should all bow out,...on the same day. That MIGHT get someone's attention. No bleeding heart, what about the patients, malarkey. If "They who are not us" really cared about the patients, things would not be a bad as they are currently. Someone pick a National Bow Out Day,.....heck, I'll even volunteer to work that day and deal with the mayhem,...until my 16 hour work limit expires! That will give plenty of time for administration to become competent ICU nurses! bgxyrnf has 10 years experience. We genuinely worry and care about our patients that it often consumes us. When a patient codes or expires, we are crushed. I once had a patient who got stuck at least 15 times by various staff members, including physicians, to get IV access. The patient took those sticks like a champ, but I still went home and boo-hooed because I hated to see him go through that. We hurt when our patients hurt. To me, this is the root cause of your issues. Personally, I do not worry about my patients. I assess them and intervene as I'm able. After that, I accept that things will run their course and I do not fret about it. When a patient dies, I generally remains dispassionately detached from the occurrence. I have had a couple of experiences with children that have made me sad and for which I've shed some tears but even then, I keep it at an arm's length... and I am never 'crushed' because I don't let myself care too much about it... because... this is my *job* and my job is to provide nursing care, not to become emotionally connected to what's happening. Sometimes I do begin to care more than I should and I actively nip it in the bud. And I certainly do not hurt when my patients hurt, even when we must poke them time and again, or when urology struggles to place a catheter, or difficult intubations, or chest tube insertions, or all the other invasive and painful things that we do to patients in order to treat them. I always recognize my role and that is of the professional nurse who is being paid to provide a service, one which I take very seriously and strive to perform at the highest level. My heart is my own and is reserved for my personal life. I would encourage you to seek counseling in an effort to learn to separate yourself from your work. Nursing is not a calling nor a mission; nursing is a job... and one which will chew you up if you get too close to it. I wholeheartedly agree. Why are you calling the unit when you are at home? You are becoming too emotionally attached and taking the profession too personally. I admit, there are families and patients I connect with. There are deaths that bother me. I may cry once in a while. But the moment I clock out, I'm done. I might vent or take some time on my drive home to decompress, but when I'm off, I'm off. I don't call the unit. I don't lose sleep over my day. I think if you could learn to compartmentalize, you might learn to like your profession. You sound like a very compassionate person. I'm sure you are wonderful with patients. Just realize, you can't save the world. This is not a calling as the previous poster said. This is a job. You go to work to pay your bills. Be good at your job, but don't let it consume you. Whether I care too much or not enough about a patient does not negate the fact that we are hit with so many responsibilities that shouldn't be ours, then we can not provide the patient care that is needed for our patients. My point is the patient care aspect of nursing is fading and almost non-existent. It is all about pleasing the physicians. On top of taking many roles in addition to nurse, we seem to care more for our patients than the docs do. Whether a patient truly touches my heart or if I can't wait to get rid of them, I'm still going to provide optimal care as best I can. I am not trying to be Supernurse, I don't want to be. They don't pay me enough. But my plan is to go to work everyday and provide care. I don't plan on getting close to my patients, but there is one or two every so often that I check on after I have passed them on. That's just how we do on our unit. Every unit is not like the unit I work on. There are some patients we keep tabs on. I understand that is extra. If my getting too attached to all of my patients were a problem, trust me I wouldn't have lasted six years. But over these six years, I'm doing less for my patients and providing more for the docs and the institution. That's why I'm ready to call it quits. I thought I was quite compassionate and nice in what I was saying to you. I was acknowledging your strengths and at the same time tell you your weaknesses could be used for positive things. Its not all about the physicians where I work. Sure, I have some crappy ones who get crappy with me. I let it roll off my back as I know they have bad days as well. If they want to ignore my question or get crappy about it? Guess what? I don't do the task they wanted performed. It's that simple. I don't tolerate it. Sure, they can be crappy when I ask a question. That's their prerogative. It's also my prerogative not to get that test done that I was asking about. You are letting people who mean very little in your life run it. You are letting them and their attitude ruin your day. Why? Why are you allowing that? These physicians only have anything to do with me at work. Work does not come home with me. Stop calling the unit. Stop allowing these jerks to ruin your day and a profession you worked so hard to get into. You worked hard throughout nursing school and to pass NCLEX, right? Then why let some over-inflated ego jerks take that from you? Why? That's my point. It's all about the physicians where I work. I actually meant the reply for the comment above yours, but somehow my phone scrolled down to your post instead. I'm trying to copy and paste my response to the post above yours, but my phone or this thread won't let me. I agree with a lot of the things you've said. Often times I think, "Why does everything fall on the nurse? I should be caring for my patients." A lot of secretarial and IT tasks take up precious time. But before you completely leave nursing, why not try another hospital? Or even leave bedside nursing and try a different field? There are so many options with nursing. You don't need to completely leave the profession just yet. If you don't like the "other duties as assigned" parts of your job, have you considered trying to organize a collective bargaining unit at your workplace? That can go a long way toward eliminating "responsibility creep", and can give ample recourse against the "we have a stack of resumes" threat. Although, if I'm surmising correctly from your username that you're in Alabama, that's probably a fool's errand. Have you considered moving to a different state, perhaps with a more egalitarian healthcare culture and worker-centric employment laws, rather than abandoning the profession you trained for, and clearly have deep emotional investment in? I'm sure that you're thinking that it's all about jerk-off docs and a system that empowers them but I sincerely encourage you to read your post with an editor's eye and see how much of it is expressing turmoil relating to your feelings about your patients. You seem like quite a compassionate and empathetic person but you're ready to chuck your nursing career in favor of working retail. Isn't that a danger sign to you? My health system is all about the docs... even to the point of putting up large portraits of them in the waiting room (which seems kinda weird to me). We are expected to pick up the pieces and serve as QC auditors on all their paperwork and their orders. If there's a mistake, it will be on the nurse, not the doc. The docs are permitted to be as rude as they care to be without any oversight. Heck, one was even physically assaultive and nothing came out of it besides an apparent talking to... nothing to the nurse to see how she might have been traumatized by the situation... nothing to assure her, or the rest of the staff, that such behavior would not be tolerated... nothing at all... just crickets. The culture is one in which the docs, if they have a problem or concern, rather than approaching the nursing staff to seek resolution, simply go directly to management to file a complaint. We hear much more about what we're doing wrong than what we're doing right. Every issue to be addressed always includes a statement about the punitive steps that will be undertaken if necessary. Rather than assuming our desire to do a good job and appealing to our maturity and professional status, we are often spoken to as incorrigible children who must be watched over with an eagle eye to ensure that we don't misbehave. When I was assaulted by a patient, the questions weren't about my well-being but rather about whether I had violated protocols and if that might have prevented the situation. All this to say that I hear you... I really do. This is simply my job... one which pays me very well and provides a stable and predictable paycheck. I am able to blow off all of the preceding precisely because I remain detached from the situational things and simply perform the duties for which they pay me... and they are the ones who get to define those duties. When I'm stuck doing mindless and meaningless tasks to satisfy some bean-counter or compliance person, rather than taking care of patients and providing the kind of service that I'd want for my family, I simply remind myself that I am not in a position to establish policy and that they are paying for the right to direct me as they see fit. I strive to remain dispassionate about the work and accept that it simply is a means to an end... having the resources to pursue the things that make me happy. If you believe that your attachment to your patients as described is healthy and not contributing to your distress then so be it. I don't know you at all and if you so claim then there's nothing more to be said about it. However, the things that you describe sound very concerning. If you were my friend, or my sibling, or my patient, I would encourage you to really examine your feelings and try to determine if your connection to your patients is healthy for you. But if it's working for you, then keep on keeping on. I sincerely wish the best for you. Y'all excuse me. This is my first time posting and commenting so I'm all over the place.